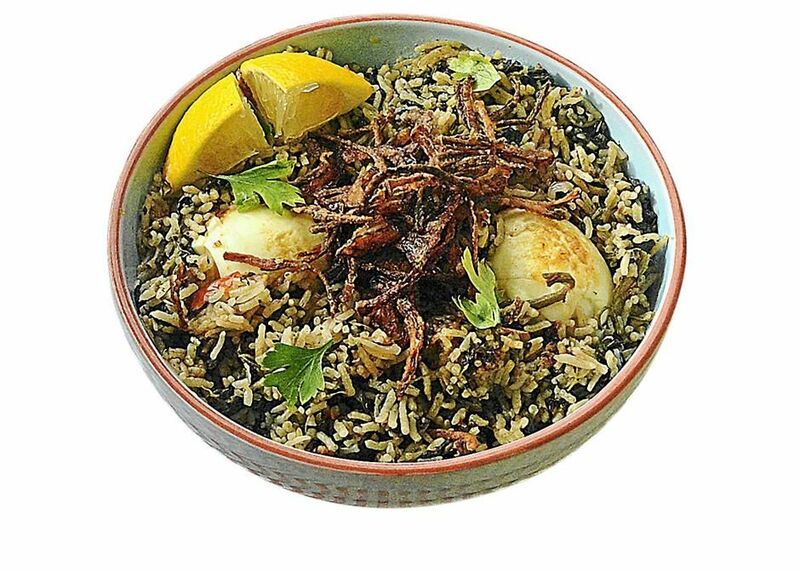 This dish is a cross between a fried rice and a briyani. This recipe is taken from the Don’t Call Me Chef column, entitled “Something for the weekend” on the theme of Sunday lunch. S. Indramalar writes the No Desserts blog. Roast the clove, bay leaves, cardamom seeds, peppercorns, cinnamon and nutmeg in a hot skillet and raost it over a low to medium for about five minutes or until nicely toasted. Grind the spices (in a spice grinder or pestle and mortar) until fine. Add 2 tbsp pf water and mix until you get a thick paste. Set aside. Using a chopper or a pestle and mortar, combine the ginger and garlic to a paste. Heat a saucepan with 1 tbsp ghee. When hot, add the washed rice and toast for 2-3 mins, making sure to coat all the rice with the ghee. Set aside. Heat 1 tbsp ghee and add the onions and garlic-ginger paste and cook until the onions start to brown. Add the tomatoes and chillies and stir together. Add the spinach and when it starts to wilt, add the spice paste. Stir to incorporate the paste with the rest of ingredients. Season with salt and turn off the heat. Put the rice, the spinach mixture and 2 cups water in the rice cooker and cook. As the rice is cooking, whisk the flour and salt together to coat the slice onions. Gently toss the onions in the flour. Heat a wok of hot and when hot enough, fry the onions and crispy brown. Serve the spinach rice with the onions on top and, if you like, some roasted cashews too. A perfect accompaniment? Yoghurt.